The 1973 Harley Davidson Ironhead Sportster for Sale has a freshly rebuilt motor and transmission is priced cheap to make a fast sale. The 1973 Harley sportster for sale is located in Moline Illinois and my asking price is $4,200 if you are interested you are welcome to submit a best offer bid when you e-mail using the comments form found directly below this classified(and don't forget to mention that you found this ad on Strike Lightning's Motorcycles for Sale gogocycles.com) and what ever you do you leave a message PLEASE don't forget to leave your contact information so that I can respond with answers to your questions or after consideration of your best offer as quickly as possible. Strike Lightning would also encourage bikers to submit a review of the 1973 Harley Davidson Ironhead Sportster for Sale to make the biker community aware of any problems that are common to this old Harley Ironhead Sportster or to highlight its positive features and help potential buyers make informed decisions. Join in and write your own page! It's easy to do. How? 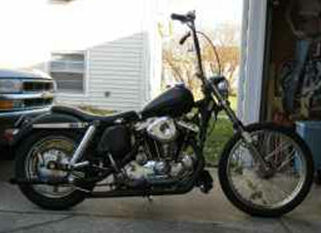 Simply click here to return to HARLEY DAVIDSON SPORTSTER - 1973.